Over the multitude immersed beneath. 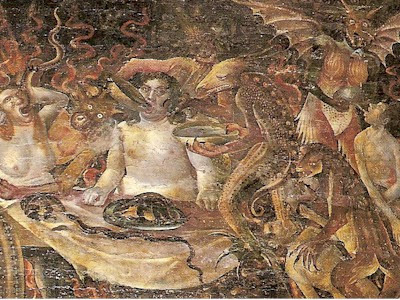 Gluttony is the opposite of temperance and is a vice caused by an affliction of Venus and Moon that take the form of overindulgence and selfishness. Commonly it refers to excess of food and drink leading to another sin, sloth or laziness that in turn opens for a general neglect of soul, body and mind that is replaced by an insatiable and constant hunger. This is why Dante places Cerberus here, the guardian of the circles that lead to more grave sins, a gluttonous monster, representing the beastly nature of black appetites. It is a warning that one might risk to lose ones divine mind and succumb ones soul to the realm of the beastly. Gluttony was seen by the Carmelite St. John of the Cross as a great impediment to reach satisfaction and grace because it would eradicate the sight for destiny and purpose and replace it with a desire for the worldly alone, where our prayers would be of personal and material gain and not for serenity and purpose. This form of spiritual gluttony is also showing itself in the erratic appetite some have for searching spiritual authority through the desire for gaining initiations for the sole purpose of status and recognition. The spiritual gluttony has turned into avarice and any satisfaction is getting lost in imbalanced appetites that lead one further away from the guidance of one’s daimons. Temperance is the virtue that keeps gluttony in check. Temperance is not about denial of the good life and the pleasures of flesh and food, but about recognition of balance and in this a desire to realize ones station in life and in the world. Temperance is the spirit of sharing and caring, to enjoy the gifts of life and the world in conformity with need and pleasure – but with mindful consideration. Heave comestibles round my plate! Obscure my seat mates stick-thin bags of bones. the premature death self-denial brings. and bedded down with Gluttony. my draught and food intake? a burger and some fries! will go to the wind!